I absolutely love the change from Summer into Autumn; it is my favourite season and the colours and textures in my home lend themselves particularly to this time of year. I definitely trend towards Autumn colours; green, ochre, brown, and greys. I also love the different events we have in Autumn and in the run up to Christmas, the ability to have fun with my decor, to go for things I might not have in my home everyday, be it flowers, seasonal fruit and vegetables (on display) or simply lighting my huge collection of candles on an evening. I’m also particularly fond of lighting the open fire, or fires since we have several throughout the house, often to great protest from the kids who are often running around like crazy and inevitably too hot! I love collecting conkers with the kids, decorating for Halloween, blackberry picking, the smells of Bonfire night and the looks of delight on my kids faces when the fireworks go off. Can you tell I love this season! So when Amara got in touch to ask me to style a “dark and moody, but grown up” Halloween, I jumped at the chance to create something fitting for my favourite season. You can see the home tour on their site here. My kitchen/dining room lends itself to creating, oftentimes flamboyant table displays. I am a maximalist decorator, after all. I love the opportunity to get creative with flowers, fruit, dig out the best table linens and plates and have a bit of fun, and that’s where I decided to start on this occasion. It has to be said that I often decorate my tables this way for different seasons and especially when guests come over for a special occasion, so this look is not just created for photos but is easily achievable if you wanted to try it, say, for Thanksgiving or Christmas. Obviously the colours and textures you use, will depend on the occasion. If you are styling a spring table it will look very different. 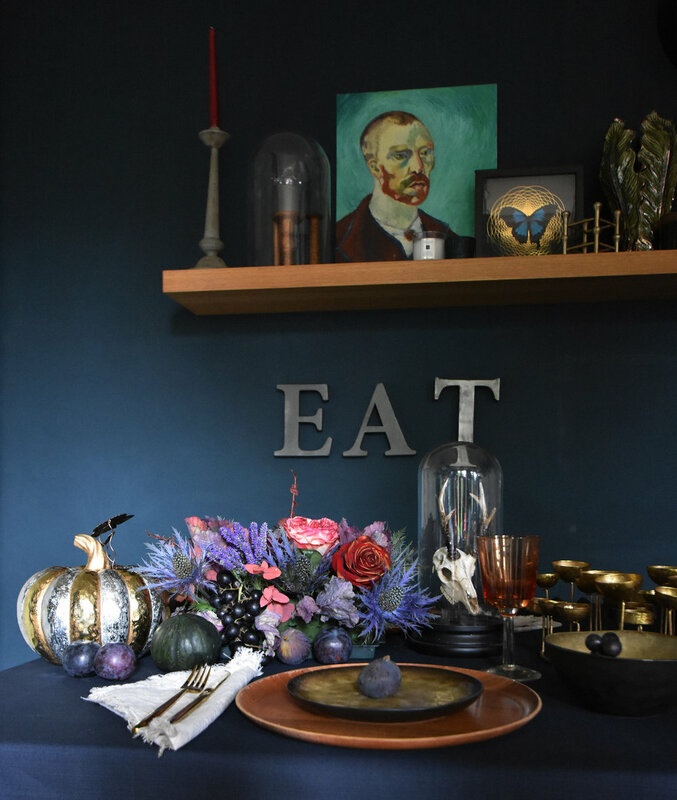 But, at this time of year you can’t go far wrong with some of the tips I’ve included below, for styling a maximalist table for this season. I chose Serax Round Plate-Gold, Serax Round Bowl-Gold and Pols Potten Wine Glasses from Amara to furnish the table with. The plates and bowls are black but the gold on them ensures they aren’t overpoweringly dark on the table. In fact the gold catches the light beautifully, and is the perfect complement to the Autumn colours. The Pols Potten wine glasses are the also perfect colour for an Autumn table; ochre, grey and orange. 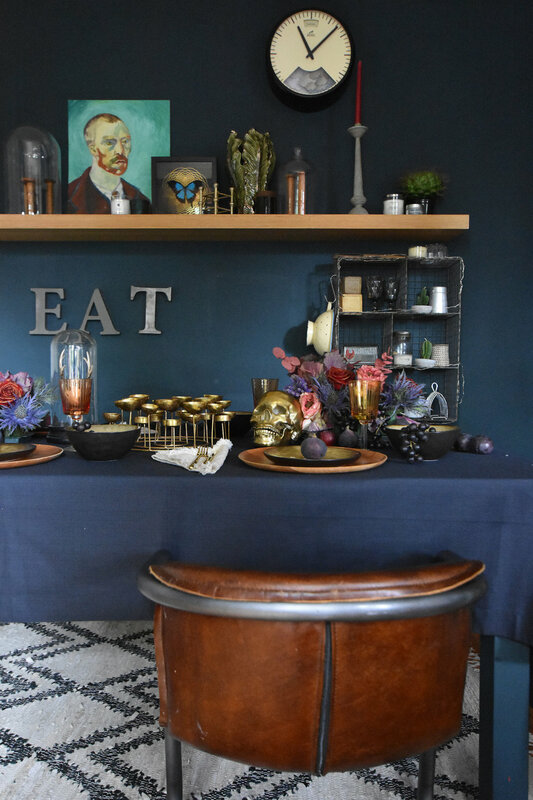 I kept the table linen the same colour as the walls; deep navy, to allow the items on the table to stand out. Gold cutlery is also a must here, in my opinion. I chose to add some colourful flowers to bring texture and interest to the table. I often style with flowers as it can really enhance the look of a table or mantlepiece. You can see another feature where I used flowers extensively here. We are also seeing the use of fruit in floristry and this time of year is perfect for picking up figs, plums, mini pumpkins and squash all of which can be added to the floral display or simply popped on a plate, as you can see in the photo alongside. I also like to use herbs, even just a small “off cut” on a plate. Here, I took two pieces of florists foam and soaked them in water and then placed each of them on a tray. I chose flowers to compliment the room colour but with a definite Autumn scheme; Blue Eryngium Thistle, Purple Cabbage, Deep Red Roses and Red- coloured Eucalyptus. It really is quite easy to create such a floral display, you simply cut the flowers, leaving a small stalk to push into the foam and arrange them all the way around, taking care to ensure that you don’t have all of the same type of flower in the same place. i.e. that different flowers sit next to each other and different colours. You can then add grapes, or other fruit, in between the flowers or simply artistically spread around the table. Because you are also cutting very small stems, you can often get a large number of smaller pieces just from a few larger stems. And, if you don’t want to buy flowers, I’d recommend popping out into your garden with a set of pliers and cutting some greenery or flowers from your own garden, any kind of greenery or flowers will certainly add to you table decoration. Because this is not just an Autumnal table, but a one styled for Halloween, I wanted to add items that gave the table a Halloween vibe; here the Decorative Human Skull, Medusa Round Candle Holder and a MacKenzie-Childs Decorative Pumpkin. These were chosen to add a shimmer to the table. -Ambience. The evenings are drawing in and having a special occasion dinner at this time of year, means lots of candles for me. I choose to use lots of gold and metallics because they reflect the candle light and after dark create a great ambience on the table. The same is true for having lots of glassware on my table; to reflect the light. -Texture. Different, mismatching crockery and tableware. In the picture above you can see I’ve chosen lighter plates to sit under the Serax Round Plate-Gold, or to the RHS, I’ve chosen wooden ones; the choice changes the look of the table. Flowers and fruit, different textiles, all add interest to the table. Pop a sheepskin on a chair or a bench or have some different coloured and textured napkins. I’ve even draped some grapes over a wine glass. That’s my maximalist style, but you can choose how much of little you add to the table. -Smell. Especially important at Christmas but I’d argue for any table setting. The types of smell you want to use will depend, of course, on the time of year, but for Autumn, I like the smell of herbs (and hence why I use them in my table setting}, Eucalyptus, rich fruity smells. 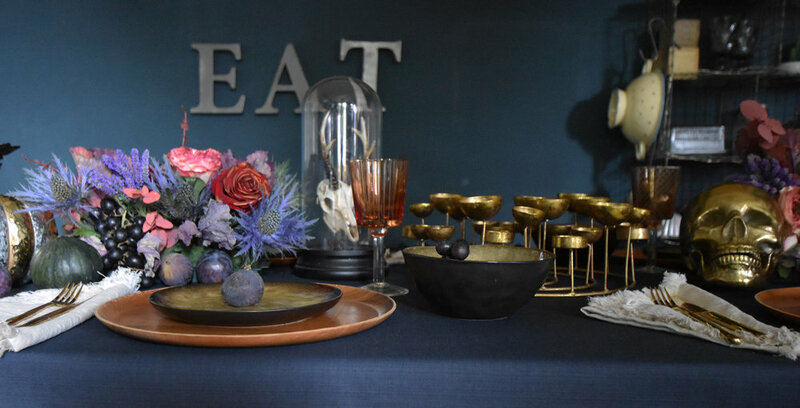 So, as you can see, adding some colour and shimmer to the table, makes it stand out against the dark navy walls, as does the use of colourful flowers and fruit. 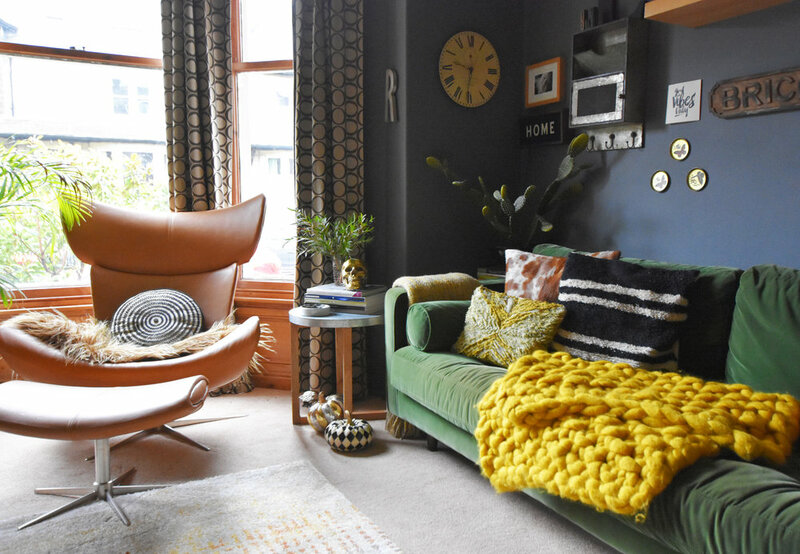 For my living room, I chose to add pops of colour to the otherwise neutral scheme. From Amara, I chose the following items to decorate this room; Decorative Human Skull, Checked Pumpkin, Casa Con Calonne Vase, Tema e Variazioni Cushion, Tom Dixon Abstract Hand Tufted Cushion, Medusa Round Candle Holder, and MacKenzie-Childs Decorative Pumpkin. You can see all of theses items in situ, above. Once again, I chose to add foliage and fruit to my scheme which you will see below and which I will go into more detail on shortly. This time I also mixed in real pumpkins for a beautiful Autumn colour. 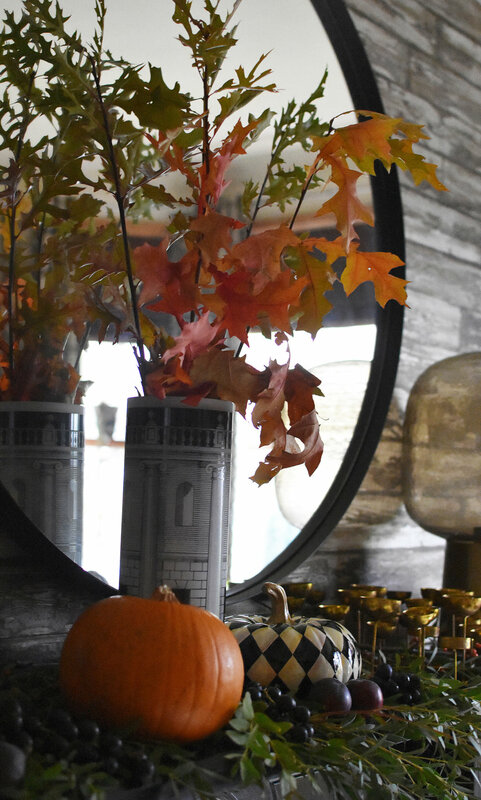 A mantlepiece is another great location for bringing Autumn or Halloween into your home. After the table, my mantle is the most used “other place” that I style for the season, changing the items and the foliage depending on the time of year. Because this wall is fairly neutral; brown ‘wood effect’ wallpaper and a black fireplace and mirror, I can get away with using some bright and vibrant colours to decorate with. Firstly, I start by placing the main items along the mantlepiece; here real pumpkins bringing a pop of orange and a Casa Con Calonne Vase filled with autumn branches. I’ve added in Checked Pumpkin, MacKenzie-Childs Decorative Pumpkin and Medusa Round Candle Holder, the latter two bringing the shimmer I talked about when decorating my table. Same applies to the mantle, especially at this time of year. I chose to drape greenery along the mantlepiece, something I do over the festive season too. Here the leaves are not secured in florists foam but were I leaving them long term, I would take the time to soak the foam in water to ensure the foliage lasts. For Christmas, I’ve been known to use faux foliage because it lasts, something that can’t be said for fresh. Interwoven through the greenery, are orange berries, grapes, plums and figs. Draping foliage over the mantlepiece, as I have done in the photos above and below, softens the harder lines of the fireplace. If you don’t want to go “all out” and style a mantlepiece, a few Halloween items placed around a side table, can easily bring the season into your home. And, why stick to just decorating the main rooms for Halloween? Kids love this time of year and adding a small amount of decor to their rooms, can help them get excited for trick or treating. For Jack’s and Alfie’s rooms, I chose Decorative Human Skull, Checked Pumpkin, Jobby The Cat, Age of Reason Ziggy Skull Cushion, Jobby The Cat and MacKenzie-Childs Decorative Pumpkin. 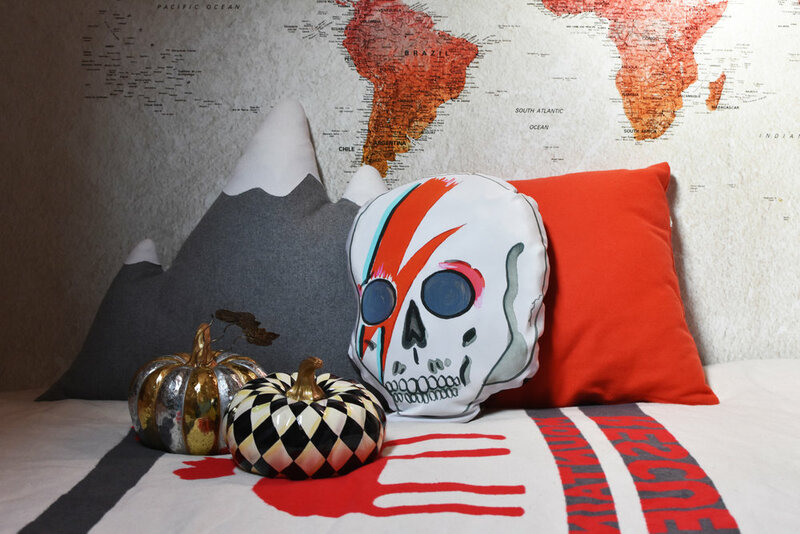 The Age of Reason Ziggy Skull Cushion adds a playful touch to their beds. Jobby The Cat was Alfie’s favourite, especially when he realised it was a lamp, and it’s eyes lit up after dark. Jack especially liked Seletti standing mouse. Mix these in with the decorative pumpkins and real pumpkins and squash and you can create a little side table display that they will love to watch after dark. I continued the Halloween theme, throughout the house and below you can see our master bedroom and my study, styled with some of the items I chose, and have showcased earlier. Here in the main bedroom, a simple display of pumpkins and a couple of cushions were enough to add a bit of a Halloween theme to the room. Items listed fully below. And since I spend a lot of time in my study, a few simple items in here, can get me in the mood for Halloween, along with the fresh flowers I used on my table, now popped into small vases. A full list of all the items I have used in the shoot, can be found below. Flowers were from Emma the Florist.